The Patek Philippe Nautilus is one of the world's most famous and coveted luxury watches. Its value has skyrocketed in recent years, making it a great investment. Vintage watches, in particular, sell for astronomical prices. "One of the world's costliest watches is made of steel." That's how Patek Philippe advertised the Nautilus in the 1970s. Today this luxury sports watch is one of the most sought-after and famous watches in the world. Demand is so high that waiting lists are often several years long. Those who don't want to wait can purchase a Nautilus online, though at a much higher price. The Patek Philippe Nautilus has greatly increased in value in recent years. In 2011, the ref. 5711 cost around 27,800 USD. Today, a mint-condition timepiece costs a solid 52,100 USD. The official list price has gone from 22,344 euros (about 25,900 USD) to 26,810 euros (31,000 USD) in the last few years. This makes the standard stainless steel Nautilus an excellent investment. The collection's flagship model entered the market in 2018. It is made of white gold and contains an in-house caliber with a perpetual calendar. The automatic caliber is only 3.88 mm thick, resulting in a watch with a total height of 8.42 mm. This makes the Nautilus 5740 especially flat and the ideal dress watch. 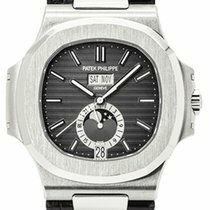 How much does a Patek Philippe Nautilus cost? One of the most coveted Nautilus watches is the standard edition with the reference number 5711 . This three-hand watch with a date display is the closest version to the original model from 1976. The 5711 is available with a blue or white dial. The blue version is somewhat more popular and costs around 52,900 USD in mint condition. Pre-owned pieces sell for a few thousand dollars less. Prices for the variant with a white dial range from 46,800 to 48,100 USD. Relatively speaking, the rose gold edition is a bargain at 65,600 USD new and 62,400 USD pre-owned. The Nautilus ref. 5712 is yet another popular model. Unlike the 5711, this watch has a small seconds dial, a pointer date with a moon phase indicator, and a power reserve display. This luxury watch comes in stainless steel, rose gold, or white gold. Gold models are paired with a leather strap. You can purchase the rose gold edition in mint condition for about 54,300 USD and pre-owned for around 48,800 USD. The white gold model is slightly more affordable: It costs between 44,600 and 47,500 USD. The most expensive version is made of stainless steel. Its price sits at 56,400 USD new and 52,800 USD pre-owned. This difference shows how coveted the steel watches are compared to their gold siblings. The chronograph is one of the most popular complications. The Patek Philippe Nautilus Chronograph bears the reference number 5980 and is only available as a rose gold or bicolor watch. The in-house caliber CH 28-520 C powers this luxury timepiece and provides it with an hour and minute counter at 6 o'clock. The rose gold model costs around 102,000 USD in mint condition and 94,200 USD pre-owned. The bicolor version is much more affordable at 64,900 USD new and 67,900 USD pre-owned. How much do the top models cost? One of the highlights of the collection is the Patek Philippe Nautilus Travel Time Chronograph with a stopwatch function and second time zone. The Genevan manufacturer presented this complicated watch at Baselworld 2014. The automatic caliber CH 28-520 C FUS is the driving force behind this timepiece. In addition to a pointer date, the Travel Time Chronograph has a day/night display for both time zones. Mint-condition examples of this stainless steel luxury watch demand around 69,000 USD, while pre-owned pieces sell for about 66,800 USD. The series' top model is the Nautilus Perpetual Calendar with the reference number 5740. Thanks to the in-house caliber 240 Q's micro-rotor, this white gold watch is only8.42 mm thick. This is a millimeter thinner than the Audemars Piguet Royal Oak Perpetual Calendar. The Nautilus Perpetual Calendar has a list price of 107,130 euros, which is around 125,000 USD. In 2016, Patek Philippe celebrated the 40th anniversary of the Nautilus by releasing two limited editions. You can recognize both watches by the anniversary inscription on the dial and their baguette-cut diamond indices. The first special edition is limited to a run of 700 pieces, making it especially rare. This model is a platinum version of the ref. 5711 — a classic Nautilus with three hands. In 2016, it had a list price of 102,024 euros (about 113,000 USD at the time). Since then, prices for mint condition pieces have risen to around 212,000 USD. Pre-owned watches cost around 194,000 USD. 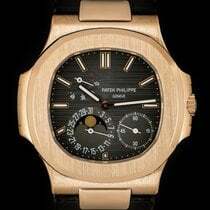 The second model is a Patek Philippe Nautilus Chronograph. Only 1,300 copies exist of this 44-mm chronograph with a white gold case. At its release, it had a list price of 86,720 euros (approximately 96,300 USD). Today, this gold chronograph costs about 192,000 USD new and 179,000 USD pre-owned. Many collectors and enthusiasts consider a Patek Philippe Nautilus from the 1970s or 80s the "holy grail" of vintage watches. Early pieces bore the reference number 3700 and were produced from 1976 to 1990. Due to their 42-mm cases, these watches earned the nickname "Jumbo." If you're interested in one of these original Nautiluses, plan to spend around 81,400 USD. Its price has multiplied in recent years. The much smaller, 37-mm Nautilus ref. 3800 debuted in the early 1980s and is significantly less expensive. You can get this model for as little as 27,200 USD. Its value has also risen greatly over the years. Nevertheless, it is still one of the most affordable Nautilus models on the market. If 37 mm is too small for you, you should take a closer look at the Nautilus ref. 3710 . This watch is 42 mm in diameter and has Roman numerals and a power reserve display. 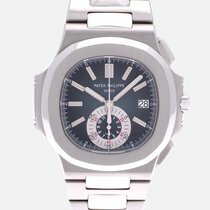 Patek Philippe introduced the ref. 3710 in 1998. Its price sits around 50,000 USD. The ref. 3711 is especially rare and, therefore, interesting to many collectors. Patek Philippe only manufactured this Nautilus for one year. Today, this watch changes hands for around 100,000 USD. The Nautilus ref. 3712 occupies the same price range. It was released in 2005, one year after the ref. 3711. The ref. 3712 features a small seconds dial, pointer date, power reserve display, and moon phase indicator. 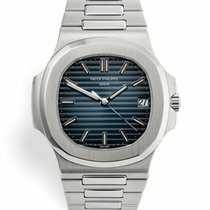 When Patek Philippe presented the Nautilus in 1976, the company broke with tradition. A sporty, stainless steel watch was completely new for them. The Nautilus was scandalous in its first few years, but developed into an iconic watch in high demand. Its look remains quite unchanged even today. It still has an octagonal bezel with rounded edges and a stainless steel bracelet made of satin-brushed and polished links. Introduced in the mid-1970s, the 42-mm case diameter caused quite a stir and led to the watch's nickname, "Jumbo." At the time, case sizes around 36 mm were the norm. The Nautilus's case construction was also novel, as it was comprised of two pieces : the bezel and the monocoque casing. Usually, manufacturers use a three-piece case construction consisting of the case back, middle section, and bezel. The Nautilus's monocoque only had one hole for the winding stem, and the bezel was pressed on. There was also a seal between the monocoque and the bezel. Together, the monocoque casing, bezel, and seal create water resistance up to 120 m (12 bar, 394 ft). Patek Philippe decided to feature a horizontal relief on the dial, giving it a sportier, maritime touch as opposed to a classic guilloche. The luminescent baton indices contributed to the watch's sporty look, as did the luminous hands for the hours and minutes. Patek Philippe used the caliber 28-255 C, which was based on a movement by Jaeger-LeCoultre. At the time, the movement was considered to be one of the thinnest automatic calibers at 3.15 mm. It also had a date display at 3 o'clock. Since the early 1980s, there have been many different versions of the Patek Philippe Nautilus. The model with reference number 3800, a mid-sized, 37.5-mm wristwatch, is available in solid gold, platinum, or a bicolor mix of steel and gold. When Patek temporarily stopped producing the larger Nautilus at the beginning of the 1990s, the 3800 became their only sport watch. 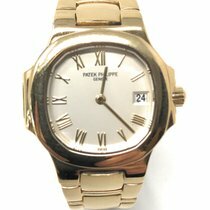 In the mid-1990s, Patek Philippe introduced reference number 5060, a wristwatch made of gold. For the first time, the Nautilus was offered with a leather strap. Its lugs were also new and lent the watch an elegant touch. This watch was the inspiration for Patek's second sports watch, the Aquanaut. In 1998, Patek Philippe reissued the large Nautilus. The watch with reference number 3710/1A had a power reserve below 12 o'clock and Roman numeral hour markers. In the mid-2000s, this model was also available in 18-karat white gold with a sapphire glass back. Another new watch was the most intricate version of the Nautilus to date. It featured a pointer date, power reserve display, and moon phase display. The caliber 240 PS IRM C LU powered the watch. Today, these complicated watches are among the most sought-after collector's items. They have the reference number 3712/1A. 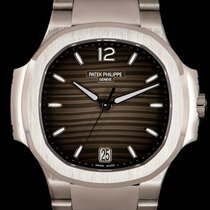 The Patek Philippe Nautilus has been part of the Swiss manufacturer's catalog since 1976. Since then, its design has remained largely unchanged. It has a few characteristic features such as its octagonal bezel with rounded edges. The porthole of the eponymous submarine from Jules Verne's Twenty Thousand Leagues Under the Sea served as the inspiration for its design. The dial with a relief embossing gives it a sporty yet elegant touch. Another interesting feature is its integrated steel bracelet. Gérald Genta was responsible for designing this watch. The designer, who had previously worked for Omega, also designed Audemars Piguet's Royal Oak, which was released in 1972. 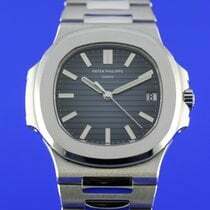 Genta presented Patek Philippe with his ideas for a steel sports watch in 1974. Two years later, they had finally agreed on the design of the first Nautilus with reference number 3700. Patek only offered classic watches in steel until 1976. Aside from the Royal Oak and the Nautilus, Genta also designed the IWC Ingenieur with reference number 1832 from the late 1970s. In 2006, the Nautilus celebrated its 30th birthday. The company took the opportunity to quietly refine parts of the timepiece. The sides became slightly domed and the diameter of reference number 5711/1A increased to 43 mm. The new top model was reference number 5980 with a flyback chronograph. In 2014, the Nautilus Travel Time with reference number 5990 was introduced. It had a chronograph function, pointer date, and could display two time zones. Patek Philippe developed an entirely new case for the caliber CH 28-520 C FUS. The hinge on the right side of the case served as a crown protector. Patek replaced the hinge on the left side with two push-pieces for the time zones, still without changing the original design. The chronograph also required two push-pieces, which were placed between 1 and 2 o'clock and 4 and 5 o'clock. The current stainless steel version has the reference number 5711. This three-hand watch, like the Jumbo, has a date display at 3 o'clock. You have the choice between black-blue or silver-white coloring, and the watch is powered by the automatic caliber 324 S C. With a thickness of 3.3 mm, it's incredibly flat and allows for an altogether sleek design. The caliber is made of 213 individual pieces and runs at a frequency of 28,800 alternations per hour. Patek Philippe has more than 175 years of history to look back on. Together with Franciszek Czapek, Antoni Norbert de Patek founded the company Patek, Czapek & Cie. in 1839. Today, Patek Philippe is the last family-owned watch manufacturer in Geneva. It is also one of the most exquisite and famous watch manufacturers in the world . Aside from the Nautilus, the Calatrava, a classic dress watch, is their other most popular model. Watches from Patek Philippe's incredible Grand Complications series regularly make headlines. Complications such as the perpetual calendar, double chronograph, tourbillon, and minute repeater are part of this company's repertoire.